EDTA, also called ethylenediamine tetraacetic acid and edetic acid, is a food additive that is generally recognized as safe by the U.S. Food and Drug Administration. It is widely used by the food-processing industry. Reading the labels of all processed foods you purchase will help you avoid this additive if this is your aim. Processed fruits and vegetables, such as canned mushrooms, may contain EDTA. The EDTA binds with any traces of metal left in food from processing or storage in metal containers, keeping the metal from causing artificial colors to break down or food to spoil or discolor more quickly. Fruits and vegetables that sometimes contain EDTA include frozen potatoes, dried bananas and canned beans. Canned shellfish, including shrimp and clams, often contains EDTA to prevent discoloration. EDTA also helps keep condensed milk from thickening, maintains the color of dried egg powder and maintains the flavor of milk. It acts as an antioxidant to keep packaged meat from turning brown due to contact with oxygen. 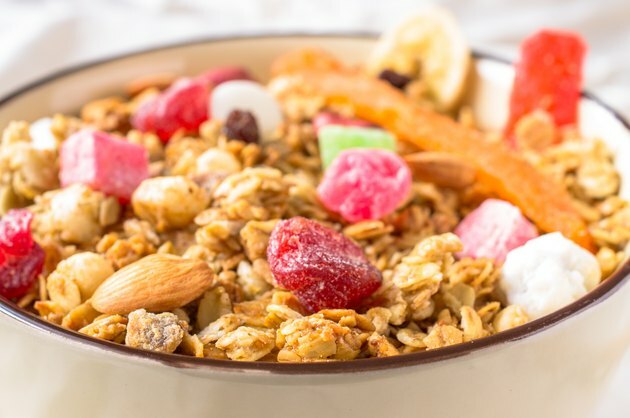 A form of EDTA called iron EDTA is sometimes used to increase the amount of iron found in grain-based products, including cereal bars and ready-to-eat breakfast cereals. Any fortified grain products may contain EDTA, as it helps stabilize vitamins. EDTA can work with other antioxidants in foods to help keep oils and fats stable and limit spoilage. Mayonnaise, margarine, sandwich spreads and salad dressing sometimes contain EDTA to keep them from spoiling and preserve their flavor, and it helps maintain the flavor and carbonation of soft drinks. EDTA also helps pecan pie filling maintain its color. What Products Contain Citric Acid? How Is Ascorbic Acid Used in Food?